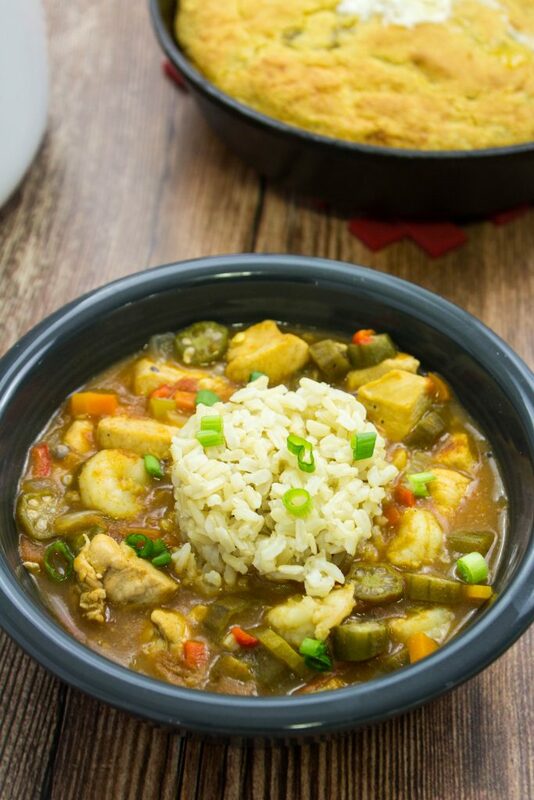 Chicken & Shrimp Gumbo is diced chicken, vegetables, okra, & shrimp cooked in a decadent broth is delicious with every bite. Weight Watchers friendly- 3 SmartPoints! There is something special about Cajun food that is hard to describe. Maybe I love Cajun food so much because over the years I’ve started to like spice. In any case, I specifically want to go to New Orleans annually just to get authentic Cajun food. 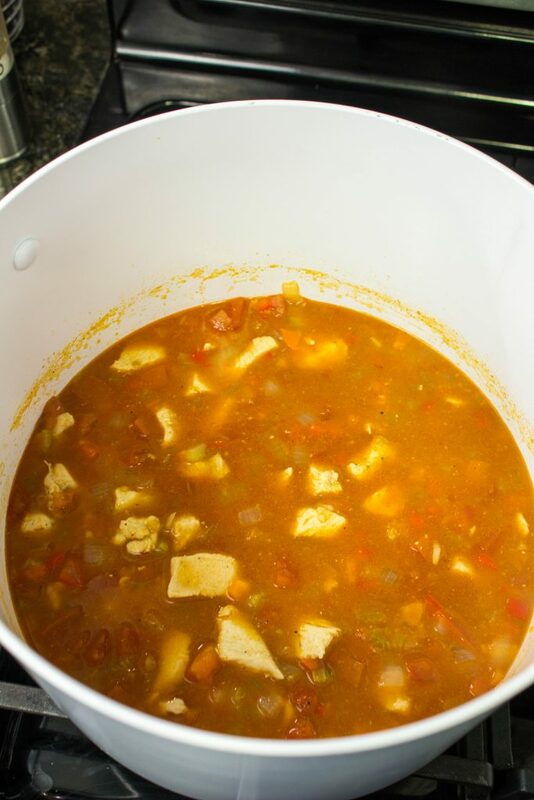 My Chicken & Shrimp Gumbo is a healthy twist on the classic Cajun dish. Diced chicken, vegetables, okra, and shrimp cooked in a decadent, perfectly spiced broth is delicious with every bite. This is a Weight Watcher friendly recipe and each serving is 3 SmartPoints. Out of all the classic Cajun dishes, I have a hard time picking which is my favorite… Po-boys, red beans and rice, jambalaya, and gumbo. They are just all SO good! My love of Cajun food started the first time I went to New Orleans (also called NOLA) about 8 years ago. I had never really had Cajun food until visiting this city and after that, I was hooked. Since then, I’ve been to NOLA about 6 times or so. My favorite part of each visit to NOLA is the food… and the music. There’s something special about eating a po-boy in New Orleans. You can really taste the love that was put into the sandwich. 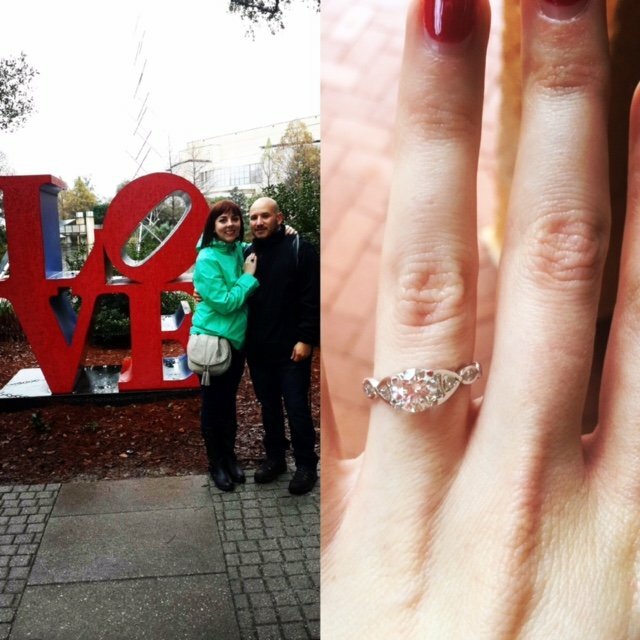 Not only does New Orleans hold a special place in my heart because of the food, but it was also where I got engaged a little over a year ago. I live in Indianapolis now, which is pretty far from Louisiana, but surprisingly there are a few places that specialize in Cajun food. In fact, there is a po-boy shop a bike ride away from my house! They actually get their bread directly from NOLA, so it’s pretty darn authentic! My husband and I love this place but have to limit ourselves to going there when we have our “cheat meal” of the week. Cajun food is delicious and decadent, which is not always Weight Watchers friendly. 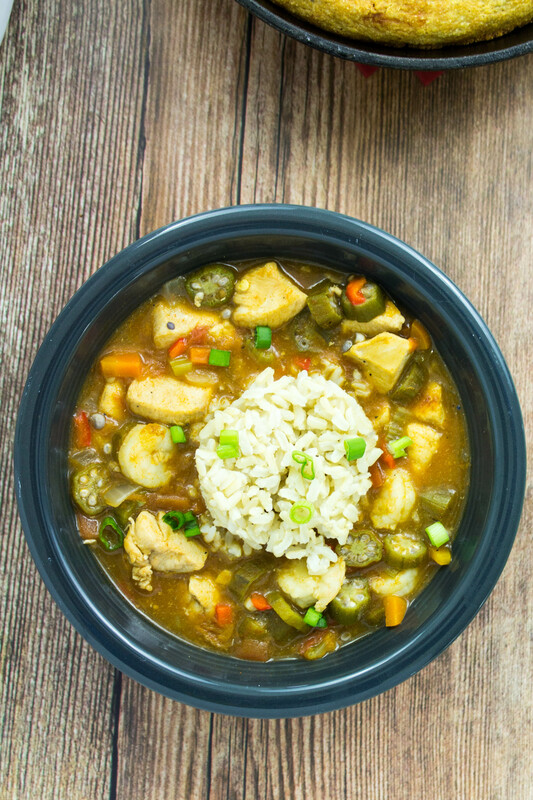 My Chicken & Shrimp Gumbo has all the flavors of gumbo without the guilt and is only 3 Weight Watchers SmartPoints for TWO CUPS! Instead of using andouille sausage (which can be rather indulgent), I used just chicken breast and shrimp. I also serve my gumbo with brown rice instead of white. This recipe is all about the prep work. 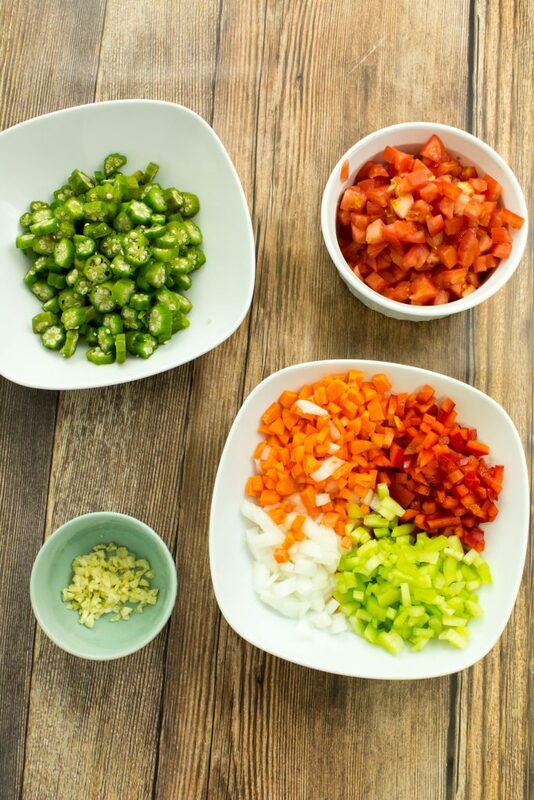 Once you prep all the vegetables, it’s super easy to follow! Dice up onion, celery, carrot, red bell pepper, garlic, tomatoes, and okra. Heat cast iron skillet over medium heat and cook diced chicken breast for about 10 minutes. Remove the chicken and transfer to a plate to rest. Add oil and slowing add in flour to the skillet, constantly whisking, and cook for a few minutes. Slowly add in a bit of chicken broth and whisk to make a roux. Gumbo is all about the roux! To the roux, add diced celery, carrots, carrot, and bell pepper. Cook for 8 minutes or so until tender, stirring occasionally. To a Dutch oven or large pot, add chicken broth and water. Add half of the roux/veggie mixture to the pot and stir to mix. Add the rest of the roux/veggie mixture and stir to mix well. Bring to a boil then add cooked chicken, diced tomatoes, tomato paste, Worcestershire sauce, Louisiana hot sauce, smoked paprika, bay leaves, and Cajun seasoning. Reduce heat to simmer, cover, and cook for 45 minutes. If you have the time, let it cook for up to 2 hours… the longer, the better the flavor!! To help thicken up the gumbo, in a small bowl add two tablespoons of cornstarch plus two tablespoons of the liquid from the pot. Mix until the cornstarch is dissolved then add to the pot and mix well. 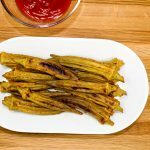 This recipe calls for okra, you can use fresh or frozen. Okra can be a bit slimy so I recommend tossing the diced okra in a little bit of lemon juice and let it sit for about 5 minutes before adding to the gumbo. The final step is to add the okra and shrimp then cook for about 10 minutes. Remove and discard the bay leaves then with rice and enjoy! Chicken & Shrimp Gumbo is a healthy twist on the classic Cajun dish. Diced chicken, vegetables, okra, and shrimp cooked in a decadent, perfectly spiced broth is delicious with every bite. 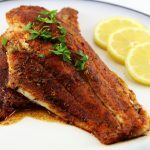 Easy to make and a great way to have Cajun food at home! 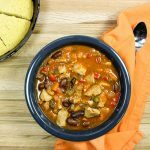 Serve with brown rice and my Skillet Green Chili Cornbread for a perfect meal. Dice onion, celery, carrot, and red bell pepper and set aside. If okra is fresh, sliced okra into 1 inch slices and set aside. If okra is frozen, thaw and save for last steps of recipe directions. Wash shrimp and pat dry. Season with salt and pepper and let sit on kitchen counter. 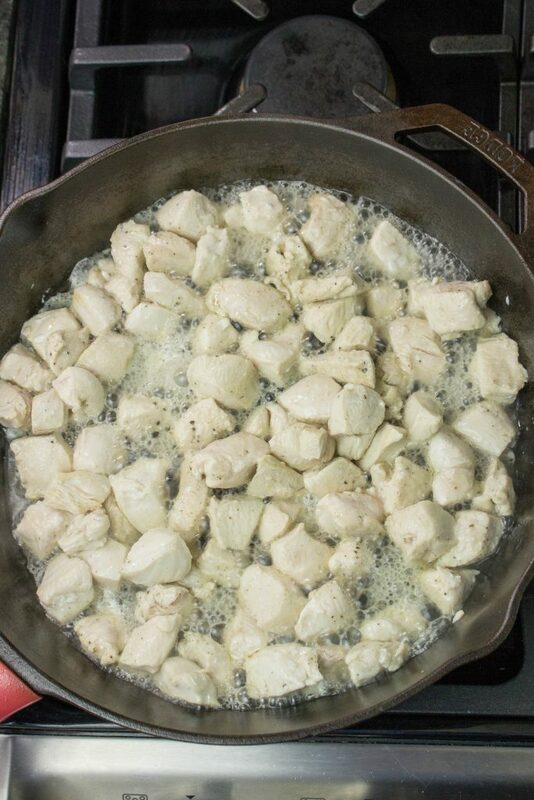 Dice chicken breast into 1 inch cubes, season with salt and pepper and set aside. Heat cast iron skillet over medium heat and add 1 tablespoon oil. Add chicken to skillet and cook for about 5 minutes on eat side. Transfer to a plate to rest. Add 1 tablespoon oil to pot and reduce heat to medium low. 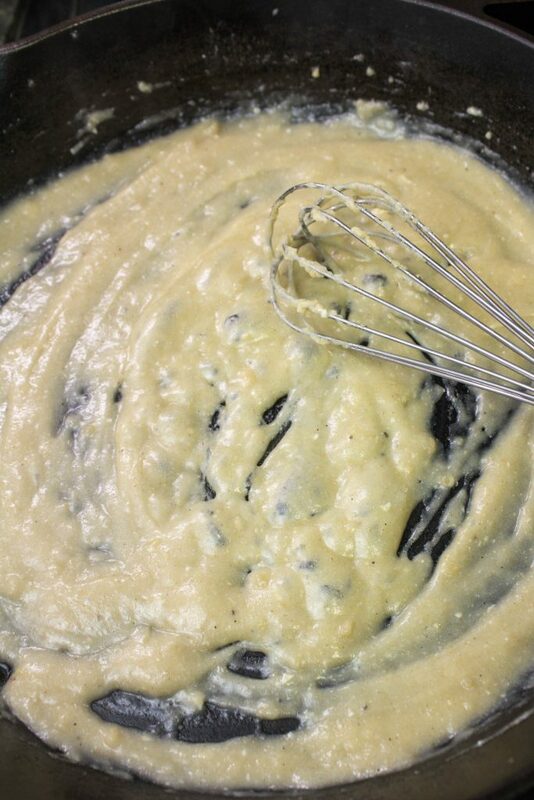 Slowly add flour and whisk until well combined, about 2 minutes, to make the roux. Add half cup of chicken broth to help break up clumps. 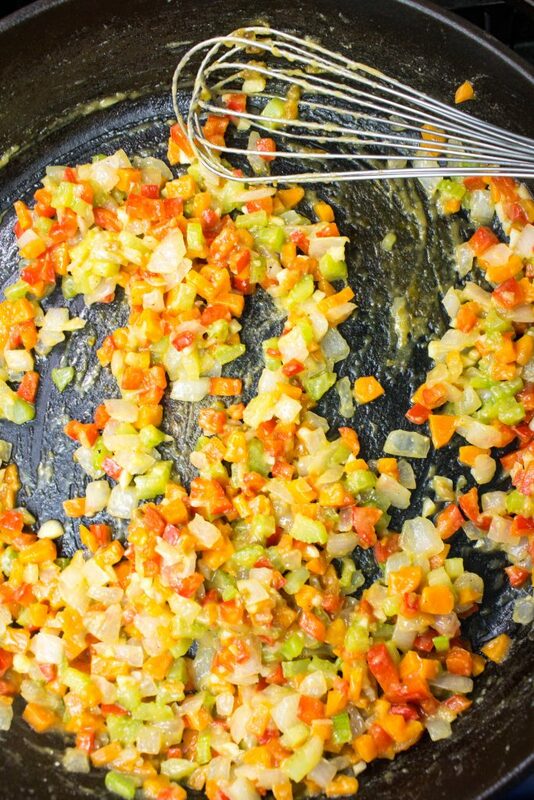 Add celery, carrots, garlic, and bell pepper. Cook, stirring occasionally, until vegetables are tender, about 8 minutes. Reduce heat to low and cook 7 minutes. Remove from heat. To a Dutch oven or large pot, add chicken broth and water and bring to a boil. Add half the roux/veggie mixture, stirring rapidly until well combined. Add the rest of the roux/veggie mixture, stirring rapidly until well combined. Add chicken, dice tomatoes, tomato paste, Worcestershire sauce, Louisiana hot sauce, smoked paprika, bay leaves, and Cajun seasoning. Reduce heat to simmer, cover, and cook for 45 minutes. Make cornstarch slurry using two tablespoons cornstarch and two tablespoons liquid from pot. Toss okra in lemon juice and let sit 5 minutes. This will help make the okra less slimy. Add okra and cook until softened, about 5 minutes. Add shrimp and cook for 5 minutes. I did not add brown rice to the Weight Watchers calculation. This is freezer friendly! 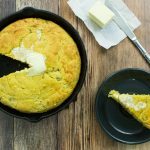 April 13, 2017 at 4:55 pm Yes, anything with cornbread is on the top of my list too! Thanks so much Lane & Holly! April 12, 2017 at 12:27 pm I neeeeed to try this. it looks amazing! My husband loves gumbo too! Thanks for the post! April 13, 2017 at 4:54 pm Thank you so much Abby! April 13, 2017 at 4:54 pm Thank you so much for the kind words Alyssa :) New Orleans is such a special place! April 13, 2017 at 4:53 pm I'm glad this healthy version is close to authentic gumbo :) You guys know good food Cameron! April 12, 2017 at 11:20 pm This sounds amazing! also?I Love that you include smart points! I just started (again) weight watchers and I love it! April 13, 2017 at 10:21 am That looks like a truly delicious homecooked meal! Love your engagement ring btw. April 15, 2017 at 9:27 am Oh YUM! Grandmothers are the best cooks :) Thanks Nina!